Overactive bladder remains one of the mostly commonly undiagnosed conditions in amongst the general population. 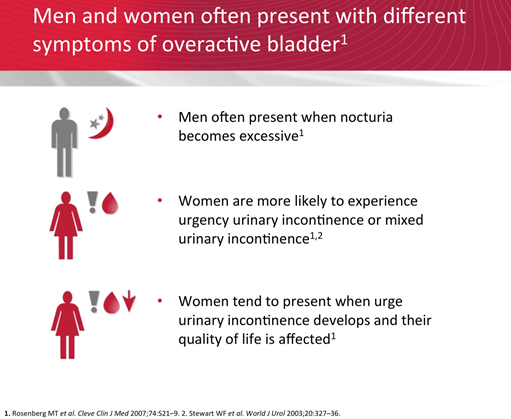 An oft research paper from BJU Int estimates 4 out of 10 patients with symptoms of overactive bladder may not actually seek medical help. Overactive bladder, or OAB, is a condition where the bladder can no longer hold urine normally. This is accompanied by urinary urgency and is often accompanied by frequency and nocturia. Indeed the most common symptom of OAB is the sudden, difficult to control, urge to urinate. This may result in some leakage. Leakage of urine is called “incontinence” and because the two are linked, a common question we often hear is: So what is the difference between having an overactive bladder and urinary incontinence? Well urinary incontinence isn’t itself a condition like OAB is, it’s a symptom which could be a result of a number of issues. For instance, incontinence could be a sign of something simple like excessive fluid consumption. But, it also can signal a more serious problem, like a urinary tract infection (UTI). OAB itself is caused by premature, uncontrolled contractions of the detrusor muscle (the bladder muscle) which results in the feeling to urinate. However, these contractions and subsequent ‘feeling’ or urinate does not always in actual urination. A person can also have ‘dry’ OAB as the mind registers these contractions as an urgent need to urinate. You’ll make it to the bathroom on time but it can cause a lot of frustration, worry and anxiety. ‘Wet’ OAB on the other hand means you may not always make it to the bathroom without leaking urine. In terms of the lifestyle causes of OAB, these vary from person to person and it is best to speak to your urologist or Dr Phillip Katelaris to diagnose your particular situation. Unfortunately, there are a number of misconceptions and myths floating around that don’t do any favours in assisting people understanding the facts about OAB. Overactive bladder is a normal part of ageingMYTH.Although prevalence increases with age, OAB should not be considered a normal part of ageing or something that can’t be helped. Prevalence is similar in men and women but generally develops later in life in menFACT. Prevalence is similar in men and women but generally develops later in life in men. The key defining symptom of overactive bladder is ‘urgency’FACT.Urgency is the main defining symptom of overactive bladder. Patients with overactive bladder should restrict their water intakeMYTH.This is a very common one the majority of OAB sufferers first believe. In fact restricting fluid intake concentrates the urine and acts as a bladder irritant. Seek professional advice, avoid ‘Dr Google’! As with all medical issues, it is always best to seek professional medical advice in all areas of urology. With over 25 years’ experience in urological practice in Sydney and abroad, Dr Katelaris can help. Dr Katelaris operates out of (3) locations in Sydney: his practice in Hornsby, Castle Hill, St Leonards with surgeries performed at renowned Sydney Adventist Hospital. Visit the Contact page for more details. [Video] What exactly is OAB? [Video] How is Incontinence treated? [Video] How do I talk about Erectile Dysfunction? [Video] What is Erectile Dysfunction?